Set in North Africa during World War II, this series chronicles the adventures of a 4-man team of commandos within the Long Range Desert Group. Armed with jeeps equipped with .50-caliber machine guns--and endless chutzpah--they wage a highly irregular war against Rommel's Afrika Korps. Their most common nemesis is Hauptmann Dietrich, though Dietrich and the Rats join forces from time to time against a common enemy. The Fatal Chase Raid: After liberating POWs, the Rat Patrol must transport to safety surly Sgt. Gribs, who possesses key information about Nazi troop movements. Along for the trip are Tex and Eddie, two privates determined to kill their sergeant for cowardice. The Love Thine Enemy Raid: During a raid on a German supply column a woman, claiming to be a nurse is shot and is in need of urgent medical attention. The team are faced with the choice of completing their mission or allowing the girl to die. The Dare-Devil Rescue Raid: Believing his father has survived a plane crash, Moffitt disobeys Troy's direct orders and sets out to rescue his father from the Germans. The Blow Sky High Raid: To knock out an Afrika Korps radar station, clearing the way for an Allied bombing raid, the Rat Patrol employs a new explosive. To get there in time, the Desert Rats must uncover an ancient shortcut through the mountains, made even more dangerous by the easily-upset French explosive, which is tossed like a snowball. The Darkest Raid: The Rat Patrol are tasked with stealing a large cache of diamonds the Germans have accumulated at a military HQ in the desert. Brute force will not succeed so they need to attempt a plan full of guile and cunning to pull the theft off. The Death Do Us Part Raid: The Rat Patrol is captured, with the exception of their commander, during a German raid. Elements of the SS want the men executed immediately however the German commander resists the instructions, buying time for the Rat patrol to try and escape. The Moment of Truce Raid: Troy and Dietrich declare an uneasy truce when both of their units are ambushed by a horde of homicidal Bedouins. The Two Against Time Raid: The Rat Patrol's mission to blow up a German ammunition depot is thwarted by Captain Dietrich. He confronts Troy but a landslide traps them together. Moffitt has orders to dynamite the site despite his entombed comrade. The Do-Re-Mi Raid: During a battle Sgt Troy is captured by the Germans. He immediately begins making plans with other POWs to breakout of prison. 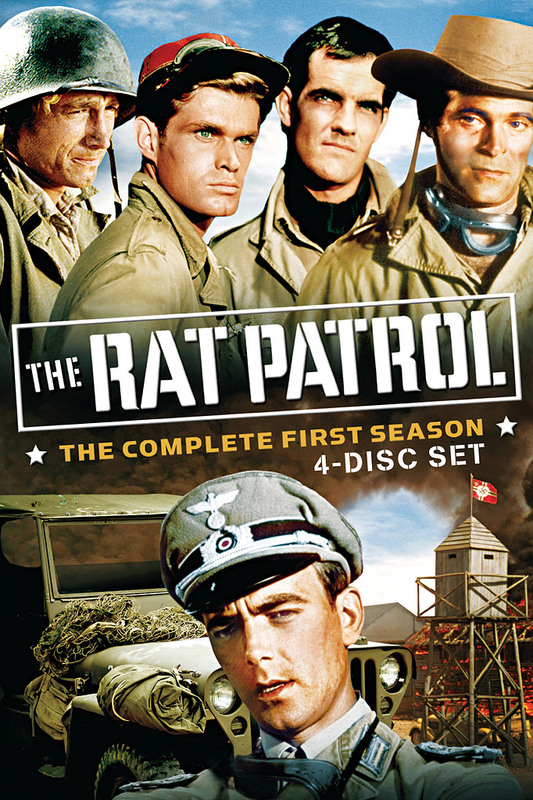 At the same time the remaining members of the Rat Patrol plan to raid the prison camp and rescue their Sargent. The Deadly Double Raid: Moffitt and Tully infiltrate a German prisoner of war camp seeking a soldier who has memorized Rommel's secret plans. But the man is dead, and now two men claim to have been his confidante. The Kingdom Come Raid: A truck carrying top secret anti aircraft shells is captured by the Germans. The Rat Patrol are tasked with retrieving the vehicle and one of their own also captured by the Germans. The Hide and Go Seek Raid: A British General's son is kidnapped by German forces, their intention is to arrange an exchange for a German General. It is decided to send in the Rat Patrol to rescue the child and foil German plans. The Violent Truce Raid: The Rat Patrol become aware that a supply of contaminated plasma is being distributed to field hospitals. When the Germans capture the convoy a moral dilemma develops whether to warn the Germans or not. The Fifth Wheel Raid: Col Jamerson is kidnapped by German forces. British intelligence are unsure if he defected or if it was a legitimate attack. The Rat Patrol are sent to find out one way or the other. The Gun Runner Raid: The Rat Patrol is taken prisoner by an embittered American soldier turned traitor. From his lavish desert compound he sells captured American weapons and equipment to the Germans. His proposition to Troy and Moffitt: Join me as partners. The Two If by Sea Raid: One of the Rat Patrol impersonate a French electrician so he can infiltrate a secret German naval base. The Street Urchin Raid: Sgt Troy infiltrate a small Arab town in Spanish Sahara searching for photos. Before he can collect them he is captured by Gestapo agents. A young boy does accidentally find the photos placing everyone's life at risk. The Lighthouse Raid: The Rat Patrol undertakes an ambitious two-phase mission. First they must rescue an ailing French Resistance leader from a Nazi stronghold and second they must smuggle him aboard a trawler launching from a German-held lighthouse. The Trial by Fire Raid: The rat patrol encounter a German force resupplying at a small village using local labor. Sgt Troy is faced with a terrible dilemma; he must stop the Germans resupplying, but at great cost to the innocent civilians caught up in the war. The Sergeant devises a cunning plan but what will be the ultimate cost to himself, his team and people of the village. The Pipeline to Disaster Raid: Gen. Owen Lansbury is rescued from behind enemy lines. He has important information about a secret oil pipeline, and the Rat Patrol are tasked with disrupting this part of the German war effort. The Boomerang Raid: The Rat patrol meet a sub off the North African coast to exchange information about German beach positions. Troy starts to wonder at the real identity of the man they have met. The Fatal Reunion Raid: The Rat Patrol meet in a small town to gain information on a new raid. Jack meets a French girl who'd sheltered him when he was injured earlier in the war. Jack has reservations about the mission, but is a solider first.